Please note that the content of this book primarily consists of articles available from Wikipedia or other free sources online. 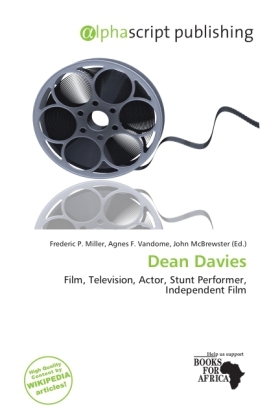 Dean Davies is a Welsh film and television actor; he is also a stunt performer. His best-known acting role is appearing as Lee in the independent film Human Traffic (1999), which explores the relationship between coming of age and the nightclub culture of the 1990s. Films: Human Traffic (1999) as Lee , House! (2000) as Food Operative , Are You Ready for Love? (2006) as Bored Journalist , Hit the Big Time (2009) as Wheel Clamper . Television: Food for Ravens (1997) as Boy; television film , The Bench (2002) as Leigh Dee; (episode 1; television series on BBC 2W). Stunt work: The Little Vampire (2000), Gwent Police Department (2009) public service announcement.